This would be an early good news and a Christmas gift to all pensioner of Social Security System (SSS). 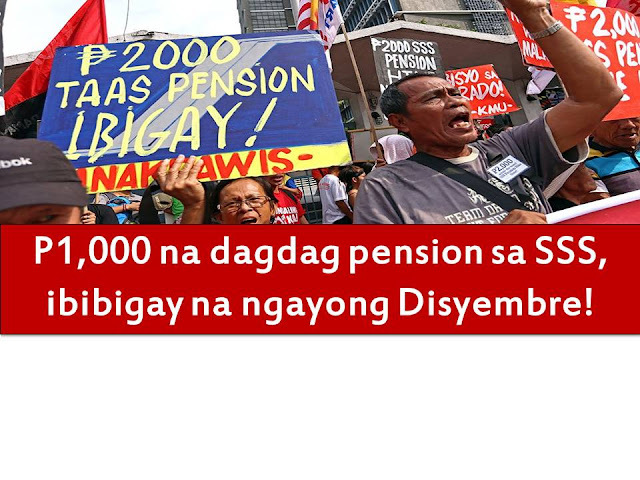 Retired member of SSS will receive this December the P1,000 increase in their monthly pension. This is after the House of Congress and the Senate approves the Joint Resolution that would increase the monthly pension of Social Security System (SSS) members by P2,000. "the P2,000 shall be given in two tranches: The first tranche amounting to P1,000 shall be given starting December 2016; while the second tranche amounting to P1,000 shall be to be extended to the pensioners in December 2019." The good news is confirmed none other than the author of the bill itself, Bayan Muna party-list Rep. Carlos Zarate. “Magandang Pamasko ito sa ating mga kababa­yan. This is a major victory for the senior citizens and the Filipino people,” said Zarete. There is almost 2 million SSS member will be benefited the increase in SSS pension starting this month.